Easter Holiday Pottery Painting Workshops - Moneybox Mondays! Join us each Monday of the Easter Holidays at one of our twice daily Moneybox painting workshops at our cosy studio. Our friendly staff will be on hand to help your little ones choose their moneybox and get them started with their own creative design. Suitable for all ages 7 plus. 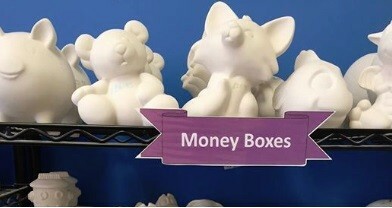 Prices start from £21.95 per moneybox to include all help, paint, firing and pieces packed ready for collection. External Website: More details about The Paint it Yourself Pottery Co. and Easter Holiday Pottery Painting Workshops - Moneybox Mondays!